When one thinks of taking a birdcation somewhere in the U.S., the same few states always come to mind first…Alaska, Arizona, Texas, and Florida. That’s where everyone goes, and for good reason. However, I am here to make the case for birding California. With the largest state list by a considerable margin and a mind-boggling diversity of habitats, I reckon we have some amazing birding to offer. So if you are thinking of doing some birding out this way, here is a quick run-down of some of the state’s best birding areas. 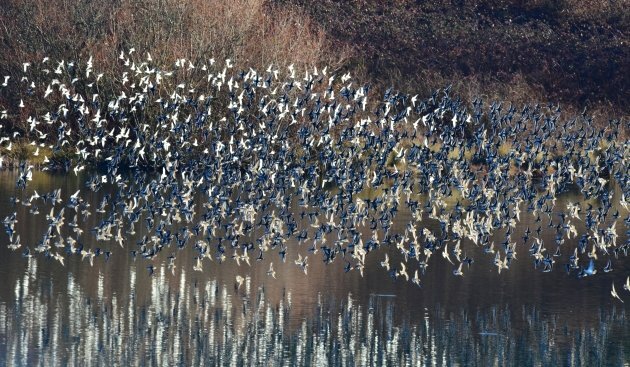 In any given year, vast numbers of shorebirds migrate through and winter in the bay area. Rockpipers and Pacific Golden-Plovers are often sought by visiting birders, and a few rarities (like this Ruff) turn up every year. Alameda, CA. The bay also hosts an impressive abundance of waterfowl in the winter. 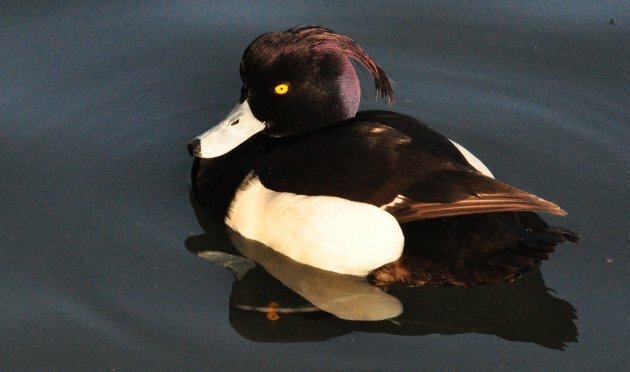 One or two Tufted Ducks show up at Lake Merritt in Oakland every year, with this drake in particular often lending itself for soul-satisfying views. The lake is a great place in winter for seeing grebes and diving ducks close up, and can offer some good gulling as well. Lake Merritt, Oakland, CA. 1. The Bay Area. We have a little bit of everything here. Good shorebirds and passerine migrants in fall. Good gulling in winter. Yellow-billed Magpies are found just inland, and Tricolored Blackbirds can be found on Point Reyes (a legendary migrant trap) by the thousand in the fall. Not far south of the bay area are Santa Cruz and Monterey Counties, which offer some great birding of their own. Seawatching along the coast can be very productive, especially at spots like Bodega Head and Pigeon Point. I haven’t spent much time here in spring, but late winter and early spring can be conducive for hearing singing Black Rails, which occupy many marshes in the area. The newly-coined Ridgway’s Rail are not as difficult to track down. Best seasons here: Fall and Winter. Trumpeter Swans take flight at dusk. Modoc National Wildlife Refuge, CA. 2. Northeastern California. This lovely corner of California is vast, beautiful, sparsely populated, and very wild. It is easily the part of the state with the lightest birder coverage, so if you want a “get away from it all” kind of trip, this is the place to go. 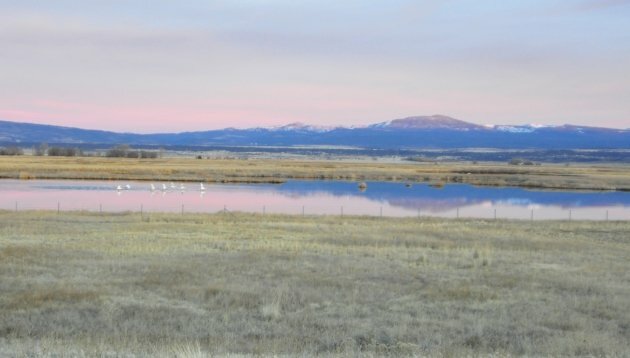 Tule Lake National Wildlife Refuge offers a fine show of raptors and waterfowl, Modoc National Wildlife Refuge has reliable Trumpeter Swans in winter, and the Warner Mountains are home to Cordilleran Flycatcher in spring and summer. 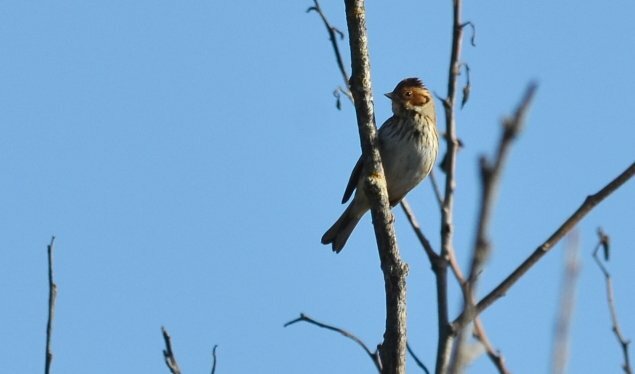 Other specialties include Bobolink, Sandhill Crane, Black Tern, Pinyon Jay, Juniper Titmouse, Bohemian Waxwing (rare), Northern Shrike, Black-backed Woodpecker and American Tree Sparrow. Best seasons here: Winter through summer. A Little Bunting spent several weeks in Humboldt County last year. Some other mind-boggling rarities I’ve been lucky to see in this corner of the state include Common Greenshank, Common Eider, Magnificent Hummingbird, and Long-billed Murrelet. McKinleyville, CA. A typical winter scene: Western Sandpipers and Dunlin swirl over Arcata Marsh. Arcata, CA. 3. Northwestern California. Humboldt and Del Norte Counties offer top-notch birding, and a suite of species that can’t be found in the rest of the state. Marbled Murrelets can readily be found doing a seawatch or (less readily, but more surreal) by spending dawn in some old growth redwood forest. Other forest birds here include Sooty and Ruffed Grouse, Spotted and Barred Owls, Vaux’s Swift, Gray Jay, Pacific Wren, American Dipper, and Varied Thrush. On the coast Leach’s Storm-Petrels and Tufted Puffins nest on a few select seastacks, and in winter Harlequin Ducks and Rock Sandpipers can be reliably found in a couple of spots. 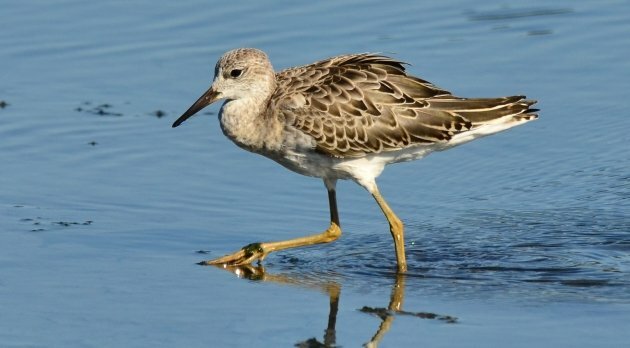 Huge numbers of shorebirds utilize Humboldt Bay for most of the year. The long-running Godwit Days birding festival is based in Arcata and is held every spring; Godwit Days has field trips that seek out many of the regional specialties. Best seasons here: fall through spring. 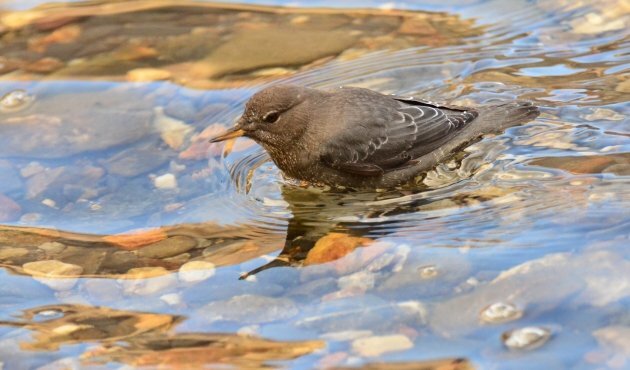 American Dipper can be found in much of California, but either side of the Sierras provide many opportunities to track down this charismatic bird. Convict Lake, CA. 4. The Sierras. A lot of birders head to Yosemite for Great Gray Owl, Sooty Grouse, and a suite of other high-elevation specialties (Northern Pygmy-Owl and Flammulated Owl, White-headed Woodpecker, Williamson’s Sapsucker, Cassin’s Finch, etc.). Of course, the Sierra Nevada is a huge mountain range, and there are countless other places to bird besides Yosemite. I’m lumping the eastern side of the Sierras in this section, which includes places like Mono Lake , Crowley Lake, the White Mountains and many other great spots. The east side can yield Broad-tailed Hummingbird, Greater Sage Grouse, Gray-crowned Rosy-Finch, Sagebrush Sparrow and the annual spectacle of gulls, grebes and phalaropes feasting on Mono Lake. Best in spring and summer on the west side, spring through fall on the east side. Black, Ashy and Fork-tailed Storm-Petrels. 2013 was a great year for finding massive rafts of storm-petrels off Bodega Bay and Half Moon Bay. Bodega Bay, CA. Buller’s Shearwater. 2013 saw impressive numbers of Buller’s Shearwaters off the coast as well, sometimes viewable from shore. Half Moon Bay, CA. 5. Northern California pelagics (Monterey Bay north to Humboldt County). Buller’s and Flesh-footed Shearwater, Ashy and Fork-tailed Storm-Petrels, Tufted Puffin, Marbled Murrelet (Half Moon Bay) are easier to find in northern California than in the south. Hawaiian Petrel has become an annual visitor in recent years, and albatross are more abundant in this part of the state. Black-footed is common, Laysan are sporadic, and Short-tailed are not unheard of. 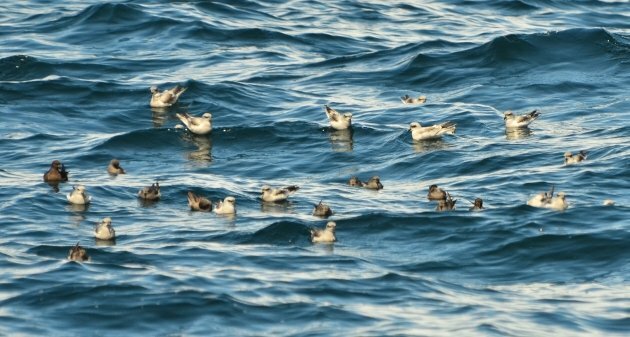 Late fall trips frequently turn up Short-tailed Shearwater, Black-legged Kittiwake and Ancient Murrelet. Good year-round (winter trips are few and far between, however). 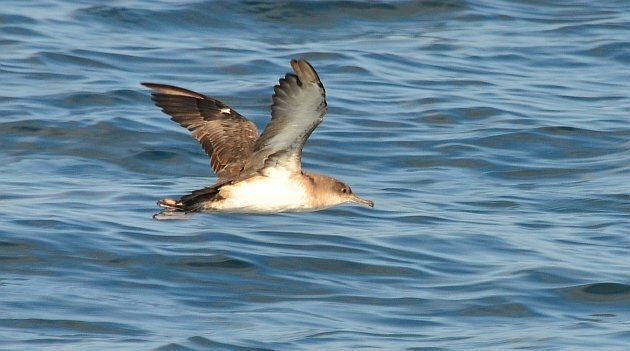 Black-vented Shearwater can be abundant in southern California waters some years, as they have 2013-2014. Ventura, CA. 6. Southern California pelagics (San Diego to Morro Bay). 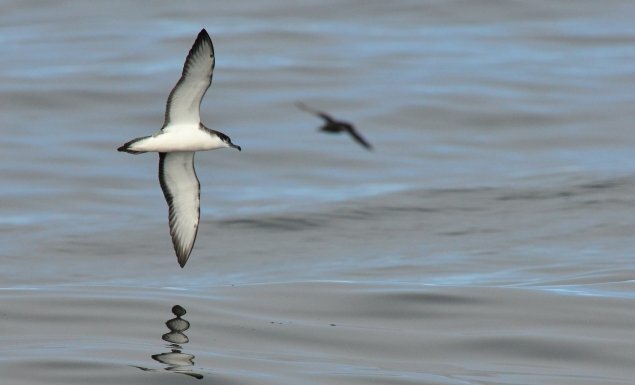 These trips are more apt to yield southern-flavored alcids (Scripps’s, Guadalupe and Craveri’s Murrelets), Black and Least Storm-Petrels, Black-vented Shearwater, Red-billed Tropicbird and boobies than trips in the northern half of the state. Good year-round. 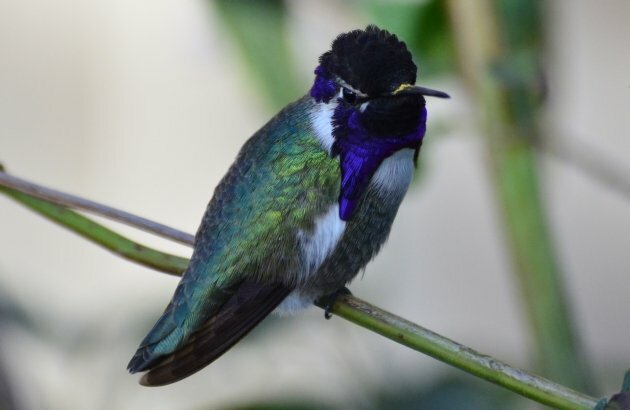 Costa’s Hummingbird is often easy to find in the desert, but they are not uncommon in hills and canyons along the coast. Coastal southern California also can produce Anna’s, Allen’s, Rufous, Calliope and Black-chinned during the spring. Ventura, CA. Everyone has to go to Ventura if they want to get on the Island Scrub-Jay boat, so why not bird the mainland too? 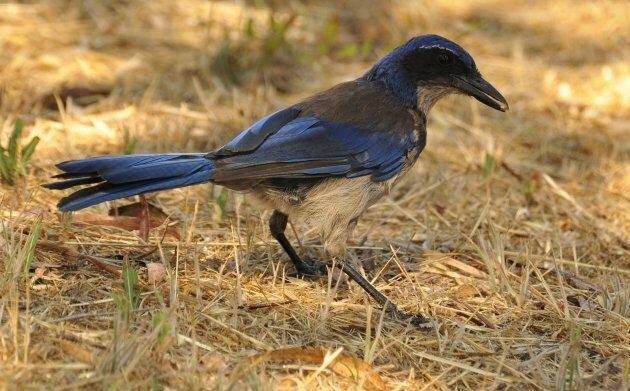 A new development for California birders is the potential split of Western Scrub-Jay…we may soon be the only state to have three species of scrub-jay!!! Santa Cruz Island (obviously), CA. 7. Southern California coast (Orange County north to San Luis Obispo County). All of these counties have migrant traps that can be very productive in fall, whether you are looking for western migrants or those of a more unexpected variety (i.e. Ventura County is a hotspot for Yellow-green Vireo in the fall, for some reason). Each of these counties have very impressive county lists, which speaks to the diversity of habitat found in each one; Ventura, for example, can offer Pinyon Jay, Clark’s Nutcracker, Scott’s Oriole, Gray Flycatcher, California Gnatcatcher, Bell’s Vireo, Least Bittern, Yellow-crowned Night-Heron, and Scripps’s Murrelet. Yellow-billed Magpies are found in the northern counties, and the Carrizo Plain (San Luis Obispo County) is a favorite location for many California birders (Mountain Plovers, Burrowing, Short-eared and Long-eared Owls, LeConte’s Thrasher, Mountain Bluebirds). Southern California always has a host of interesting wintering rarities. Fall through spring. 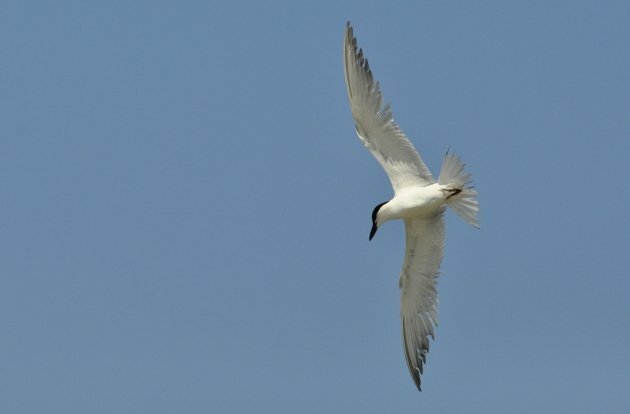 Gull-billed Terns breed in south San Diego Bay, along with Black Skimmers and several other tern species. Imperial Beach, CA. 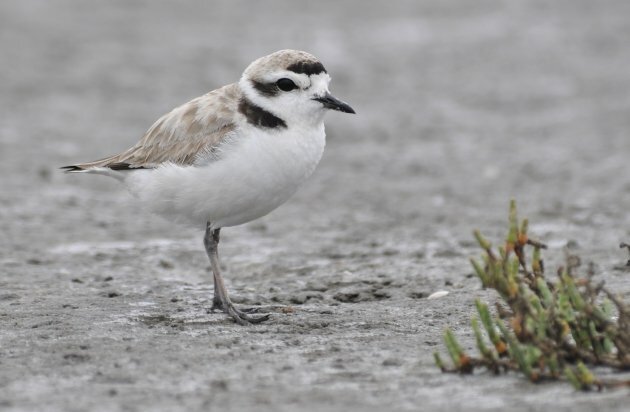 San Diego County has many important nesting sites for the imperiled Western Snowy Plover and California Least Tern. Escondido, CA. 8. San Diego. Although not dissimilar to counties to the north, San Diego deserves its own praise. Like the Salton Sea to the east, San Diego has a host of birds difficult or impossible to find in much of the state, including Harris’s Hawk, Reddish Egret, Little Blue Heron, Yellow-crowned Night-Heron, Gull-billed Tern, Black Storm-Petrels from shore, and Gray Vireo inland. Like the rest of SoCal, there are always a host of wintering rarities here. Point Loma is a great migrant trap, La Jolla offers high-quality seawatching, bird-filled wetlands are easy to come by, and the Anza-Borrego Desert is not far away. At times, it seems that vagrants for all points of the continent are showing up in San Diego County. Best fall through spring. 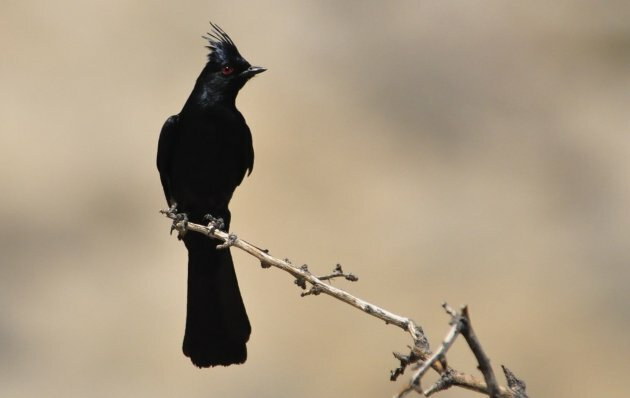 The one-of-a-kind Phainopepla; lovers of desolation and extreme temperatures. Agua Caliente County Park, San Diego County, CA. 9. The desert. A large part of California is desert, extending from Imperial and San Diego counties in the south northward into Inyo County, home of Death Valley. The desert is a strange and wonderful place, and has a strong allure to many a birder. The desert has its own avifauna…Bell’s and Black-throated Sparrows, Bendire’s and Crissal Thrashers (with luck), Scott’s Orioles, Cactus Wrens, Ladder-backed Woodpeckers, Black-tailed Gnatcatchers and the like. Riparian areas and springs can yield Lawrence’s Goldfinch, and Brown-crested Flycatcher is a local breeder. California birders love the desert for its migrant traps…there are a number of hotspots that can pull in huge numbers of birds, including some true rarities. Gray, Dusky and Hammond’s Flycatchers can turn up in impressive numbers. Kern County hotspots are birded the most heavily, but places in Inyo and San Bernardino counties can be great as well. Best spring and fall. 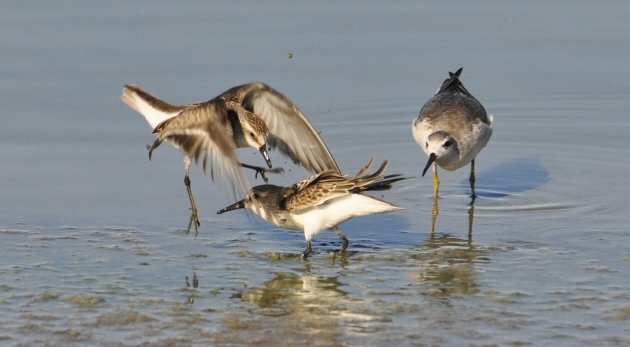 A Semipalmated Sandpiper leaps over a charging Western Sandpiper, while a Wilson’s Phalarope watches with keen interest. McDonald Road, south end of the Salton Sea, CA. 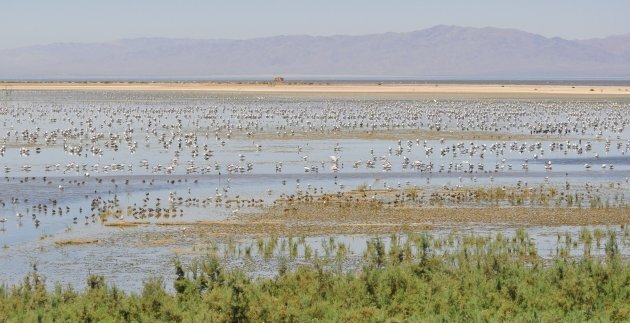 The problem for birders at the Salton Sea is not typically having a lack of birds to look at; it’s too many. Bowles Road, south end of the Salton Sea, CA. 10. The Salton Sea. The Salton Sea is one of my favorite places on earth. It’s truly bizarre…an accidental, stinky, extremely saline lake with millions of birds, just a few miles from Slab City and Salvation Mountain. Salton Sea specialties include Yellow-footed Gull, Wood Stork, Neotropic Cormorant, Gila Woodpecker, Mountain Plover, Gull-billed Tern, and a staggering population of Burrowing Owls. Rarities like Lesser Black-backed Gull, Blue-footed Booby, Magnificent Frigatebird, Chestnut-collared Longspur and Sprague’s Pipit are semi-expected at certain times of the year. The number and diversity of rare birds here that have been found over the years is truly staggering and many birders prefer birding here to anywhere else in the state…some of my personal favorites vagrants from the area are Roseate Spoonbill, Rufous-backed Robin, Curve-billed Thrasher, Le Conte’s Sparrow and seeing 4 species of longspurs at the same spot! There are plenty of desert species to see here as well. Good year-round, although triple-digit summer temperatures can add an element of difficulty. So there you have it! Come bird our great state. The birds are waiting. No mention of the Central Valley? That picture of Salton Sea just blows my mind.